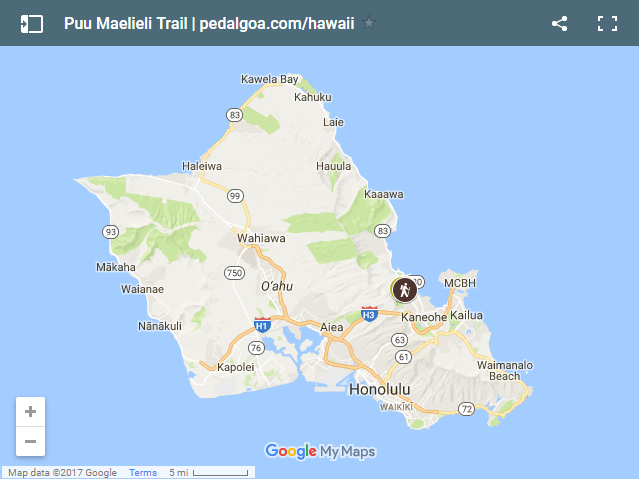 Puu Maelieli Trail: directions + map + pictures :: kaneohe hikes. oahu hikes. Hawaii inspiration and travel tips on Pinterest: Follow the Hawaii Outdoor Travel board! This page is a brief overview with pictures on how to get to the Pu‘u Ma‘eli‘eli Trail. 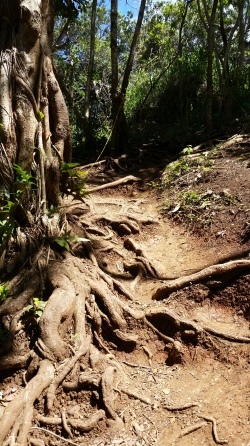 Puu Maelieli Trail is a hiking trail in the Kaneohe region of Oahu. 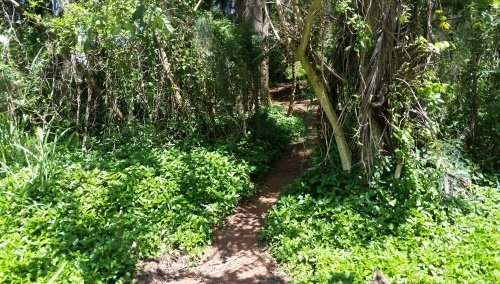 This trail is recommended as a hike to do if you’re looking to get out of Waikiki for a day and want a hike that offers you stunning coastal views! 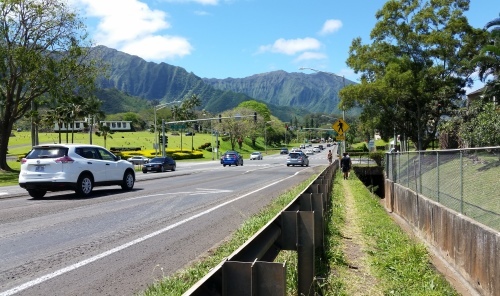 You’ll also get the mountain views of the Koolau range just by being in Kaneohe too. This Oahu hike is lesser known, which means that it’ll be less crowded compared to popular hikes on Oahu. This is a mostly easy trail, with a few parts that are steep with loose gravel that requires you to hike with extra caution. 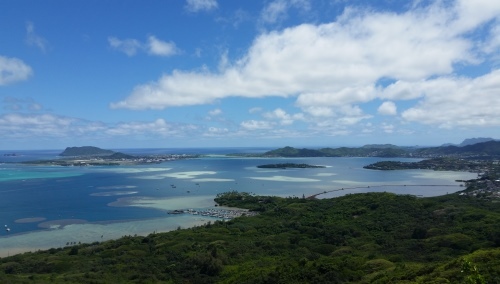 The distance of the Puu Maelieli Trail is less than 2 miles round trip, and you’ll want to allow 1-2 hours to complete the trail with time at the summit. According to Hawaiian mythology, Pu‘u Ma‘eli‘eli translates to “digging hill.” The companion gods, Kane and Kanaloa, once raced to the top of the hill and had to “dig” into the slope with their hands to climb up. The bunkers found on the summit are the remnants of the Heeia Combat Training Area (Camp Heeia) built during World War II to support nearly 4,500 military personnel. Explore the map of the Puu Maelieli area. 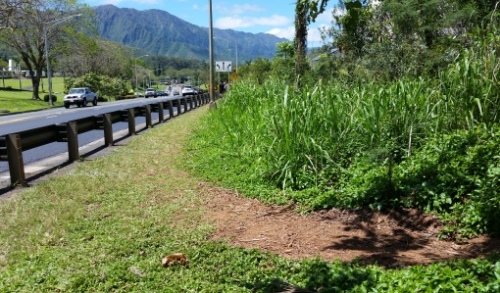 The “trailhead” of the Puu Maelieli Trail is somewhat hidden on the side of the Kahekili Highway. 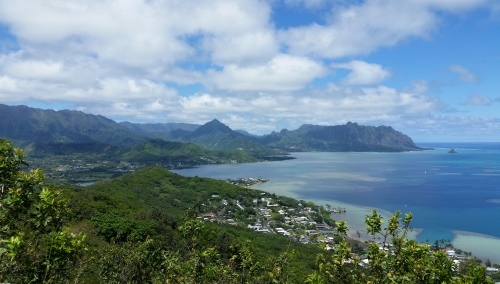 Whether taking the bus or driving, you’ll start your Kaneohe hiking adventure on a side street that’s a few minutes away. 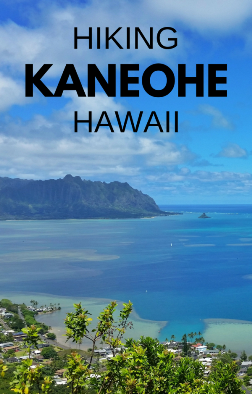 From Waikiki to Kaneohe where the trail is located is a little over an hour by bus. 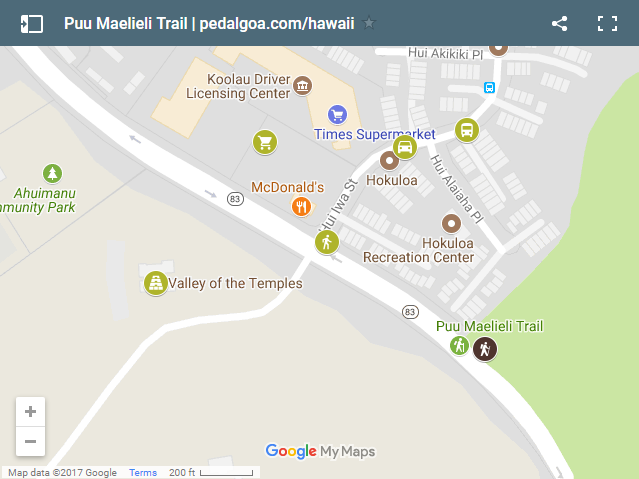 For bus directions to Puu Maelieli Trail from Waikiki, have a look here. 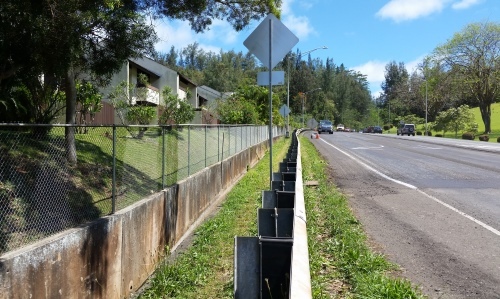 See here for tips on taking the bus in Oahu. Since the trailhead is on the highway, it’s not possible to park directly by the trailhead. If you’re driving in from the south, which would be from Honolulu or Waikiki, one of your main landmarks will be the McDonald’s. There’s a traffic light at the intersection where McDonald’s is located, and you’ll want to turn right onto the street. Another landmark is the Valley of the Temples where the Byodo-In Temple is located. The Valley of the Temples will be on your left at the intersection, so you’ll be turning away from it. If you look at the map above, you’ll see a car symbol right above the Hokuloa symbol. 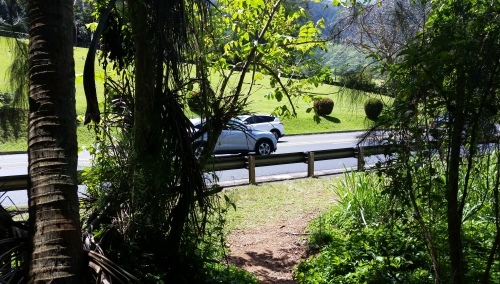 It’s usually around there that people who drive to the Puu Maelieli Trail will look for parking. This is at the start/end of the trail. You see the trail starts right off the highway. Once you park your car or get off the bus, you want to walk back down towards the highway. Turn left at the traffic light. That would be south, away from the McDonald’s. At some point, you’ll have to climb over the guardrail to get to other side. There is a makeshift path at the beginning for you to follow that may be faint in some parts. Keep walking until you find the start of the trail! It’ll probably take you around 5 minutes or so. Now here are some more pictures so you know kind of what to expect! This is the view heading towards the trail. The condos will be on your left as you are walking towards the trailhead. This is the unofficial path leading to and from the trailhead. 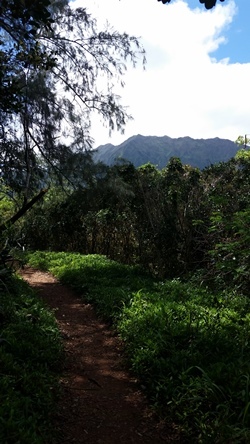 The Koolau mountain range will be at your back when you’re walking towards the trailhead. This is the trail entrance. And you can now start your hike! The bus around Kaneohe isn’t as frequent as taking the bus around Waikiki. It will also require at least one transfer. But if time and waiting aren’t an issue for you, the bus is otherwise convenient! What’s convenient is that the bus drops you off pretty close to the trailhead. The bus stop is right in front of the Temple Valley Shopping Center, across the street from the entrance of the Valley of the Temples. The stop is on the street where people who drive to the trail would park, so you can follow the same directions as above once you get off the bus. It will take around 1.5 hours to reach the shopping center from Waikiki by bus. To plan your trip and get more details of the bus route, see the Google Maps transit directions. HAPPY PUU MAELIELI TRAIL HIKING!